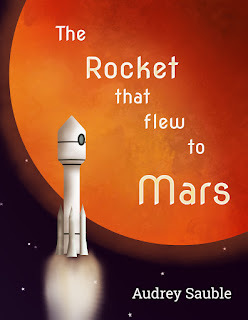 I wrote this book for my own son, since he's been fascinated with rockets for the past year. As a family, we've been reading rocket books, watching the Space X rocket launches, and talking about rockets incessantly, besides creating many, many pictures for this book. I'm excited to share it with you now! This week, I’m giving away 3 hardcover copies of The Rocket that Flew to Mars. I hope you will enter, and I hope you enjoy the story! P.S. If you're excited about The Rocket too, would you mind helping me by telling someone about my book or sharing this post? Right now, I’m in the final stages of finishing a book. Make that two books? One is my new rocket book, of course, which I set up and released as a Kindle book earlier this week. I’ve got more on that coming up next Monday! The other book I’m finishing right now is a sketch book that I’ve been using since I was a teenager. I don’t know how old this book is. It has chipmunks and squirrels from long-past camping trips, swans from practicing for the Junior Duck Stamp Competition, kid doodles, an attempt at drawing the Yosemite Falls, and even weird eyeball-bulging frog eggs. This book hasn’t been my only drawing book over that time. (I mean—there’s even one just for sketching out my many attempts at a fantasy series.) This particular book has been around the longest, though, and it’s a bit strange to fill up the last pages and put it away. Oh, and yeah, I’m way behind on some things—but The Rocket that Flew to Mars is ready to launch!